Formal gold pearlised wedding invitations, coming in gold felt board with brown patterns and your bespoke invitation on an ivory card. This range is coming with gold, square, pearlised envelopes. Your personalised wording is printed in plain brown foil and the design is finished with a gold, satin ribbon. Size: 19 x 19 cm. 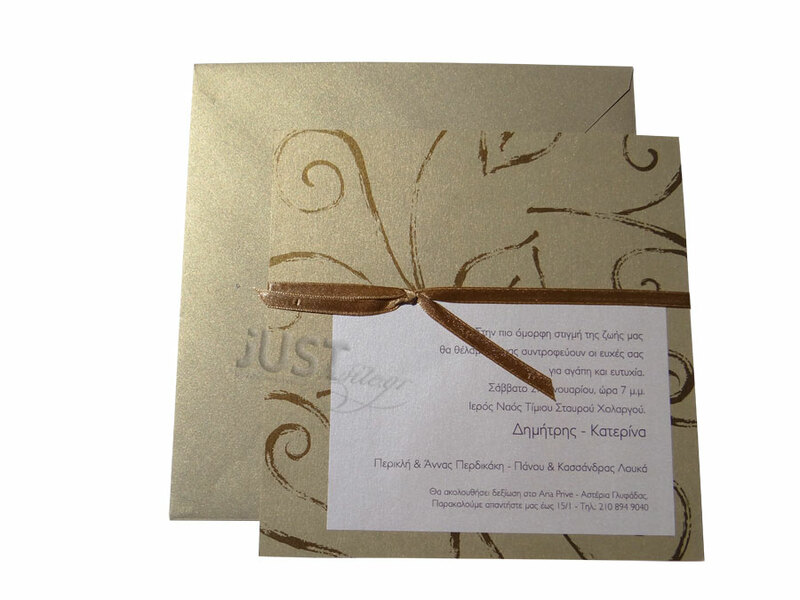 https://www.preciousandpretty.com/2017/10/gold-pearlised-wedding-invitations-A813.html Greek Wedding Favors|Orthodox Crowns|Stefana|Baptism Invitations Gold pearlised wedding invitations A813 wedding invitations, in classic style with gold details Product #: Greek Wedding Favors|Orthodox Crowns|Stefana|Baptism Invitations_51303748850340016 5 stars out of 5 reviews.